The photo on the left was taken many years ago by a relative. It has been kindly provided by Gwenda Morgan. The photo on the right was taken by me in March 2008. Closer examination of some headstone markings on each picture show that it is the very same stone. The site now displays a lot more vegetation in the area behind the cemetery. William Edward Slade was the son of George and Jane Slade. George was born in Somerset, England on 15th April 1863 and Jane was born on 25th April 1867. By 1901 they had moved to Wales seeking work. George was a railway plate layer. Later he was involved in the making of roadways in the South Wales area. Their first child Ethel was born in Cardiff, Glamorgan on 15th December 1889. Their other children were born in Nelson. Dorothy Jane was born on 20th December 1911. In Nelson, they initially made their home at 33, Heol Fawr, Nelson, Glamorgan. Situated at number 31 Heol Fawr, Nelson at the time was the first Nelson Police Station which was in a house. When the Glamorgan Constabulary opened the Nelson Police Station (now Sergeants Restaurant) at Station Terrace in 1910, the Slade family moved into the former Police Station at 31 Heol Fawr. This section of Heol Fawr has long since been demolished and has been replaced by two houses and a bungalow. Living nearby at number 34 Heol Fawr were the Williams family whose son Thomas was killed during the war. Thomas is not been named on the Nelson Memorial. Living next door to the Williams family, at number 32, Heol Fawr were the Hadley family who lost their son Reginald during the war. The photo (above) shows William as a railway employee sometime before war broke out. Nelson and Llancaiach railway station opened in about 1912 dating the photo between that date and 1914 when he enlisted in the army. This photo shows William Slade in an Army Group. He is second from the left (as viewed) in the third row from the front. William enlisted in the Welsh Regiment just one week after the declaration of war. 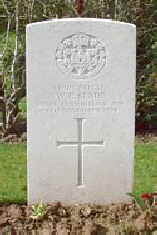 Sometime during the war he was transferred to the Royal Inniskilling Fusiliers. In September 1918 a special license was granted for William to marry Annie Duncan. They were married on the 20th September 1918 at the registry office at Dewsbury, Yorkshire. A courtesy card in the shape of a small fan that was sent to family members not present at the wedding showed that at the time, William and Annie’s address was 42 Wood Hill, Batley Carr, Dewsbury. 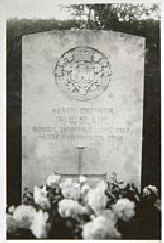 After the war, a family representative must have gone to France to visit the place where William is been buried. This rare photograph (left) shows the original cross that marked the grave. Photographs have been provided by kind permission from Gwenda Morgan who is the daughter of William’s sister Dorothy Jane. Gwenda and her family still live in the village of Nelson. On Thursday week Mr & Mrs George Slade, 31 Heol Fawr, Nelson received an official notification stating that their eldest son, Private William Edward Slade, 48910 of the Royal Inniskillin Fusiliers was killed in action on 4th November. The deceased soldier was 24 years old. He enlisted in the Cardiff Pals regiment in September 1914 and after a few months training in this country was drafted to the Balkans. He took part in all the fighting at Salonika until he contracted malaria, from which he was invalided home in May last year after being out of England for 3 years and 5 months. In June, he was sent to Redcar and on the 1st of October to France having been transferred from his old regiment to the Royal Inniskillins. 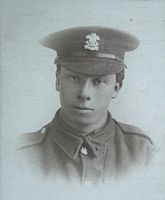 Whilst in training at Redcar, he was married on 20th September to Miss Annie Duncan of Batley Carr, Dewsbury, the ceremony taking place at Ripon. Prior to the army, he worked at Penallta Colliery.